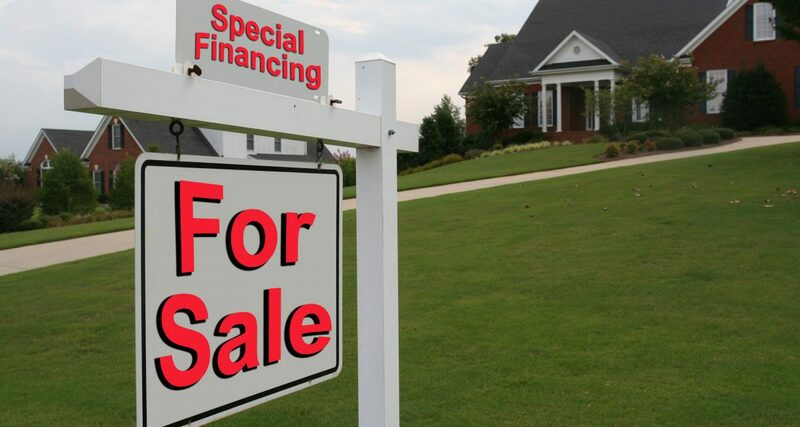 A new real estate agent’s entry into the vocation of soliciting and negotiating real estate transactions typically begins with the marketing and locating of single family residences (SFRs) as a seller’s or buyer’s agent. 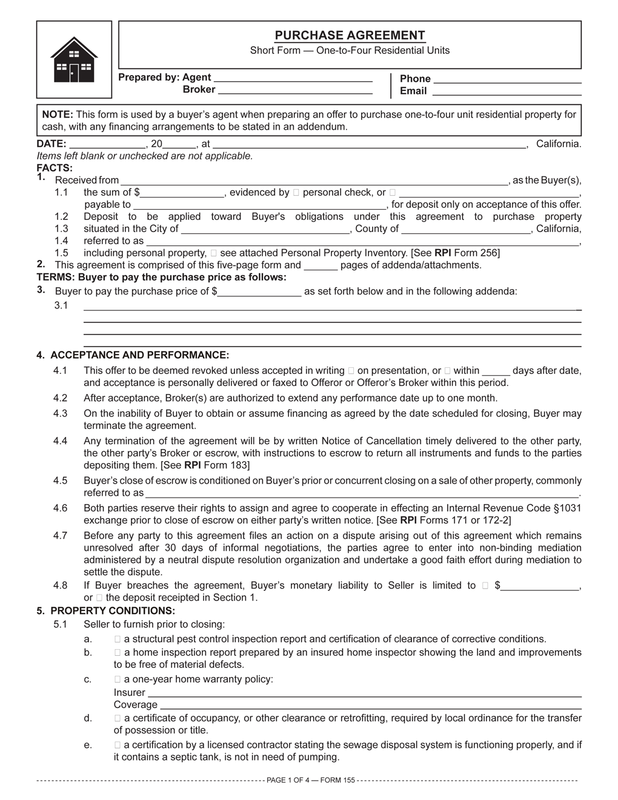 Three basic categories of purchase agreements exist for documenting real estate sales transactions. The categories are influenced by legislation and court decisions addressing the handling of the buyer protection disclosures and the different due diligence investigations taken when marketing a property. 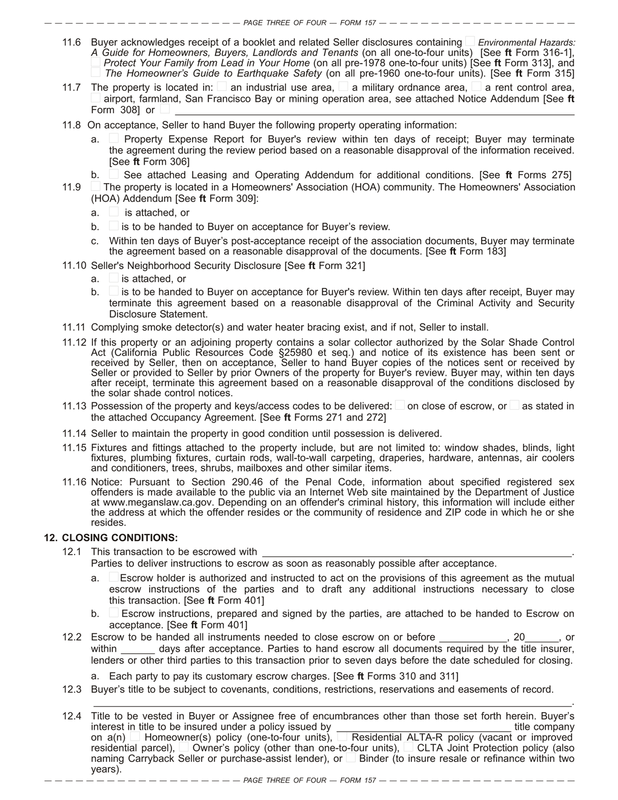 Within each category of purchase agreements, several variations exist. 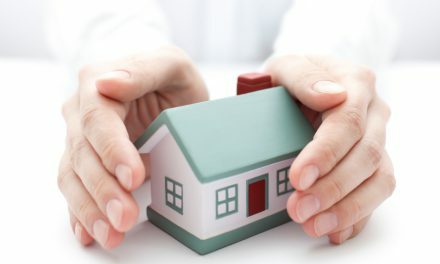 The variations cater to the specialized use of some properties, the diverse arrangements for payment of the price and to the ownership conditions which affect transactions, particularly within the one-to-four unit residential property category. the Equity Sharing Addendum. [See RPI Form 155-2]. In contrast with other purchase agreements, the principal to principal purchase agreement contains no provisions for broker representation or fees. 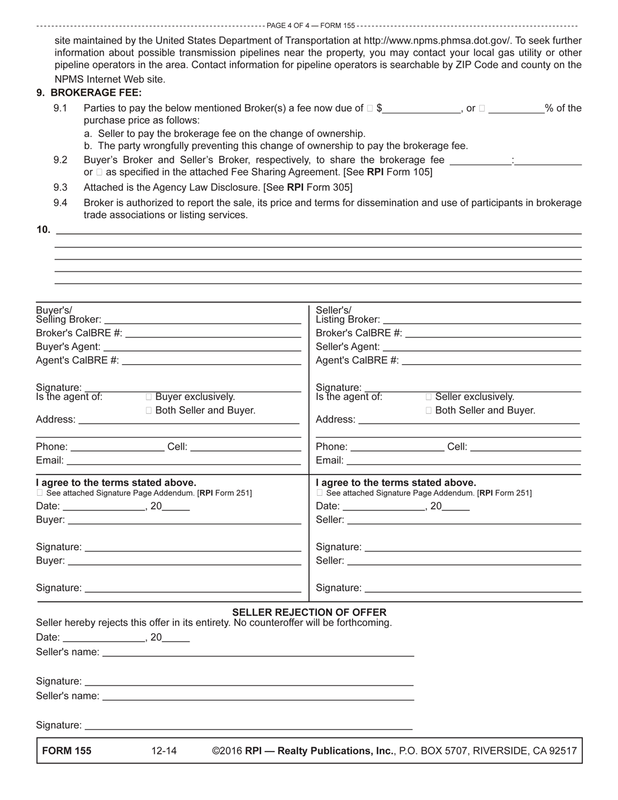 Editor’s note ­—A licensee acting solely as a principal in the purchase or sale of their own property uses this form when no broker fee will be paid. Thus, a broker selling or buying property for their own account acts solely as the seller or buyer as no agency relationship exists. 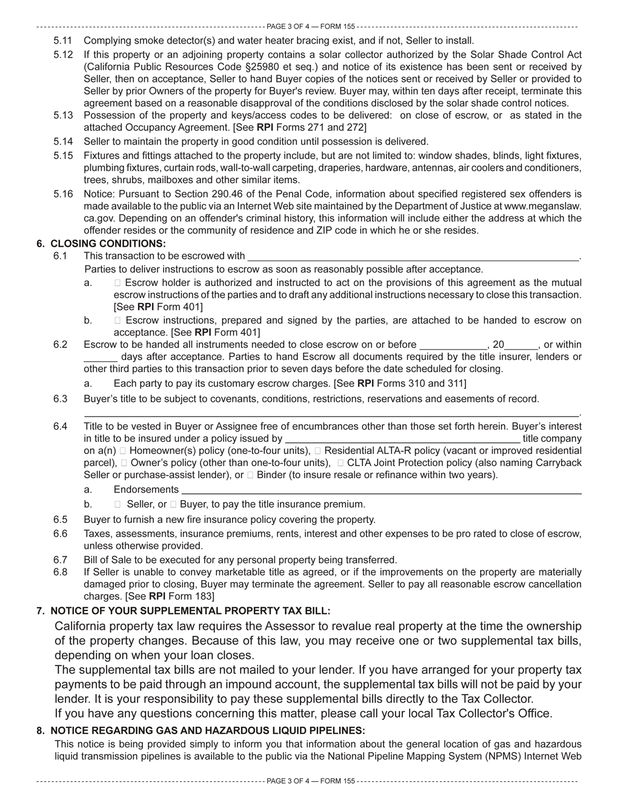 Identification: the date and place of preparation, the buyer’s name, the amount of the good-faith deposit, the description of the real estate, an inventory of personal property included in the transfer and the number of pages contained in the agreement and its addenda. Price and terms: variations for payment of the price and financing terms. 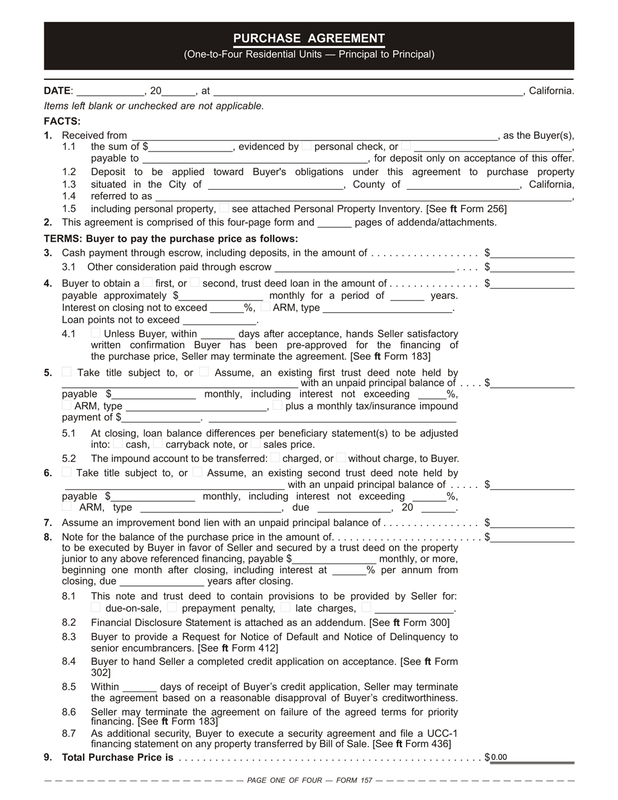 Acceptance and performance: aspects of the formation of a contract, excuses for nonperformance and termination of the agreement, such as the time period for acceptance, financing of the price as a closing contingency, procedures for cancellation, a sale of other property as a closing contingency, cooperation to effect a §1031 transaction and limitations on monetary liability for breach of contract. 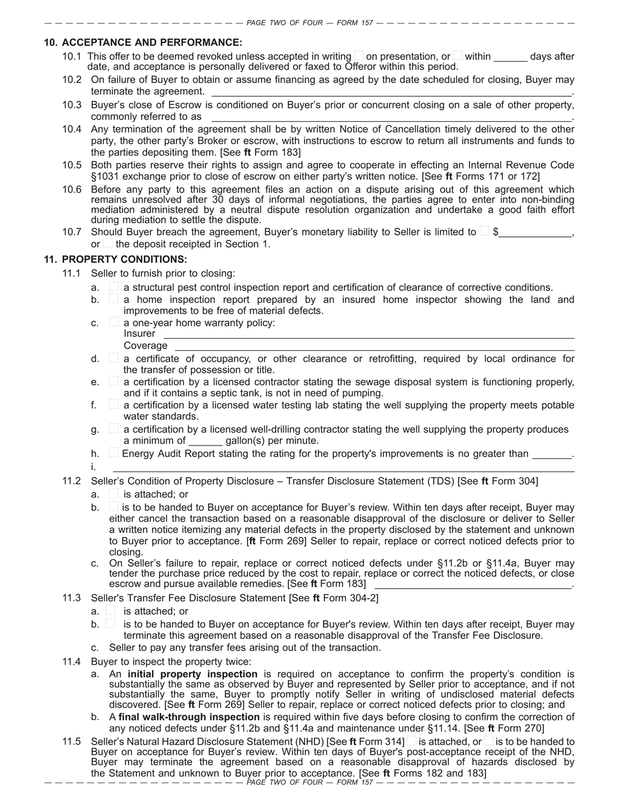 Property conditions: the buyer’s confirmation of the physical condition of the property as disclosed prior to acceptance by the seller’s delivery of reports, warranty policies, certifications, disclosure statements, an environmental, lead-based paint and earthquake safety booklet, operating cost and income statements, and homeowners’ association (HOA) documents not handed to the buyer prior to entry into the purchase agreement, as well as by the buyer’s initial inspection, personally or by a home inspector, and final inspection at closing. 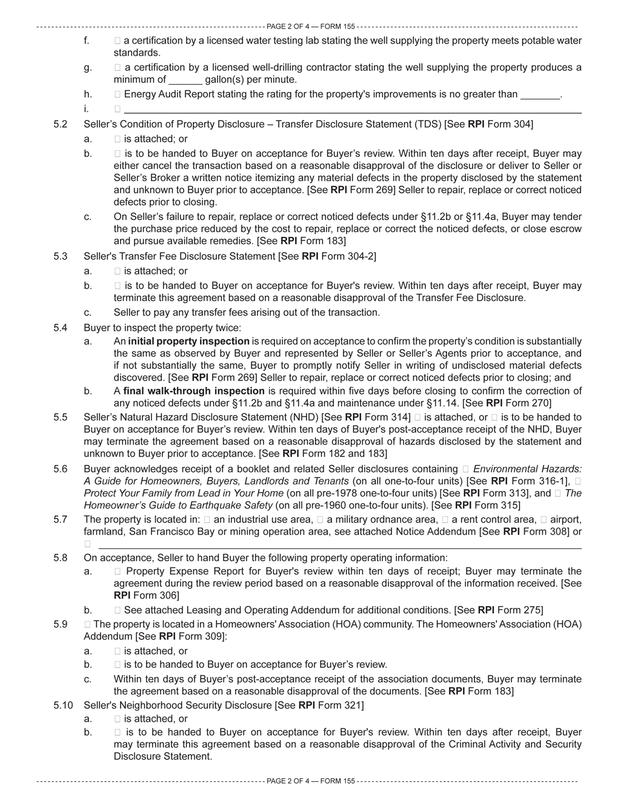 Closing conditions: the escrow holder, escrow instruction arrangements, closing date, title conditions, title insurance, hazard insurance, prorates and mortgage adjustments. 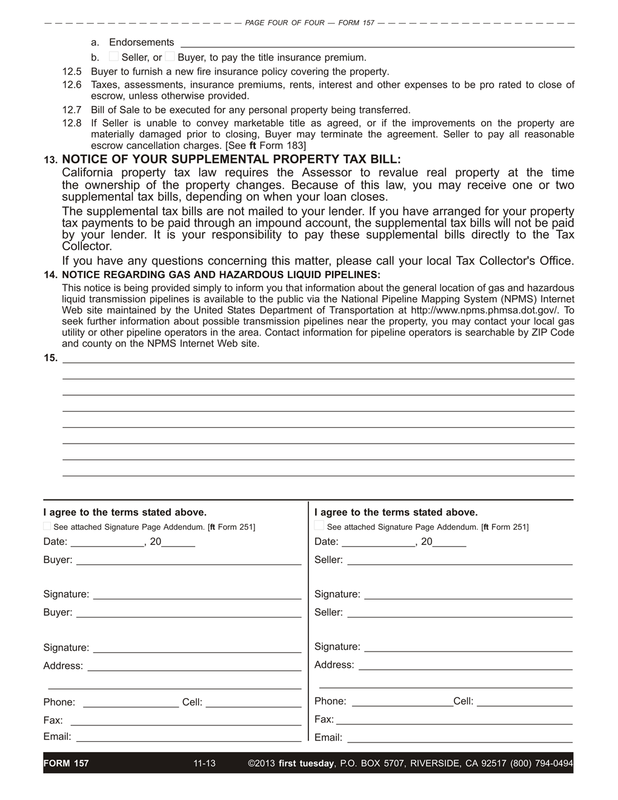 Notice of supplemental property tax: notifies the buyer they will receive supplemental property tax bills they are to pay when the county assessor revalues the property after a change in ownership. Notice regarding gas and hazardous liquid pipelines: notifies the buyer of the public availability of information regarding gas and hazardous liquid transmission pipelines via the National Pipeline Mapping System (NPMS) web site. 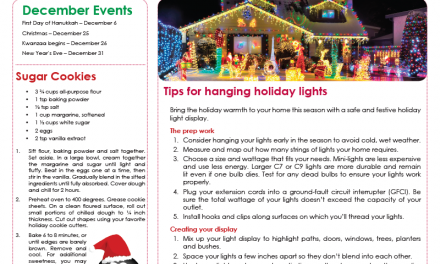 PreviousDoes the loss of view constitute a physical taking of a property? 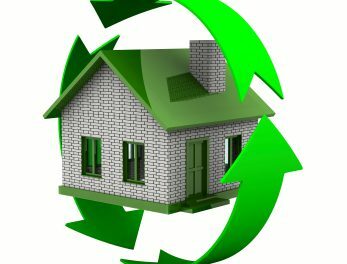 If I convert my home to a rental, does my mortgage become a recourse loan?